With the NFL season approaching our mock draft series rolls on. 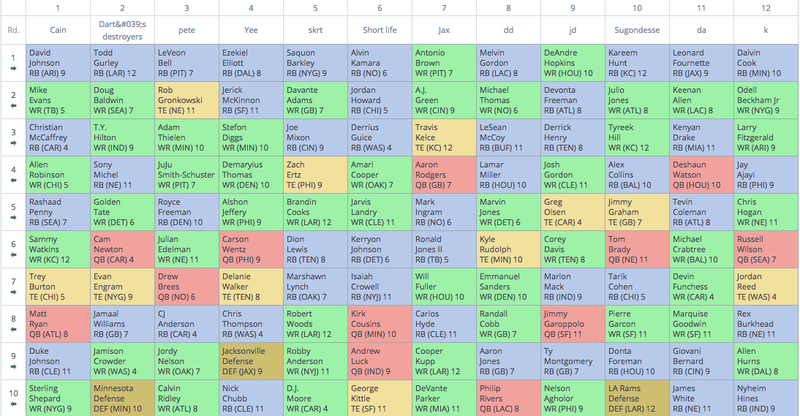 This week's mock draft series will take a look at a 12-person half-point PPR mock. This particular mock can be found here. At FantasyFootballCalculator you can join mock drafts, check out the latest mock draft results, and analyze ADP data for each player. Antonio Brown has five straight seasons over 1,200 yards receiving and four straight seasons over 150 targets. Brown is a no-brainer at 1.07 as the top receiver off the board. With elite receiver talent still on the board, Melvin Gordon presents too much risk at 1.08. Gordon has never finished a season above 4.0 yards-per-carry and quietly split time with undrafted rookie Austin Ekeler last season. Slipping to the second round, Odell Beckham comes at a discount after missing most of last season with a broken fibula. In his three healthy seasons, Beckham has recorded at least 1,300 receiving yards and 10 touchdowns. Beckham is a must-draft in the second. Despite being the favorite to lead the 49ers in touches, Jerick McKinnon has never played more than 50-percent of his team's snaps in his career and shared snaps with Latavius Murray last season. Last season Matt Breida quietly carried the ball 104 times for 471 yards for the 49ers. Last seasons target leader among running backs with 113, Christian McCaffrey usually comes off the board in the mid-second round. McCaffrey's receiving floor makes him a value in the early third round. Now competing with Travis Kelce, Sammy Watkins, and Kareem Hunt, Tyreek Hill looks like a regression candidate for 2018. Despite seeing only five red zone targets, Hill snagged seven touchdowns last year. Hill's last 13 touchdowns have all come outside of 30-yards, a number that will surely normalize. With Brandin Cooks leaving in free agency and Julian Edelman suspended for four games, Chris Hogan should benefit from vacated targets. Hogan plays a large role in the red zone for the Patriots. Last season, he recorded 12 red zone targets in nine games. With the Broncos looking to employ a running back by committee, Royce Freeman in the fifth round looks too aggressive. Devontae Booker remains the favorite for pass-game work, limiting Freeman to early-down work and suppressing his upside. 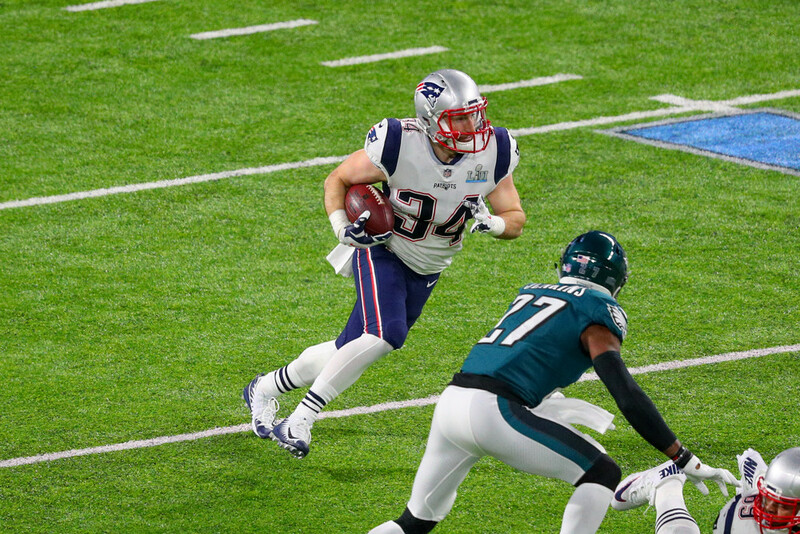 Significantly underrated, Rex Burkhead holds a passing game and red zone role for the Patriots. With Sony Michel nursing a knee injury that reportedly could cost him time early in season, Rex Burkhead should see a spike in usage. The diminutive, 5'6 Tarik Cohen profiles as the Bears' passing game specialist, while Jordan Howard should handle the early down work. Despite the ability to create explosive plays, Cohen simply won't see enough volume to warrant a pick above players like Rex Burkhead. George Kittle led the 49ers in red zone targets last season with 16 and finished behind only Evan Engram in receiving yards for rookie tight ends in 2017. Kittle will likely improve on his 60-percent snap share, making him a value in the 10th round. Coming off a Week 11 torn Achilles, D'Onta Foreman remains questionable at best for the start of 2018. A notoriously hard injury to return from, Foreman may struggle to produce in fantasy in 2018.